People have been growing aloe vera plants for thousands of years. Aloe vera is known as one of the most widely used medicinal plants. Among the many health benefits, let’s just mention it contains a lot of antioxidants, has antibacterial properties, helps the healing of burns, reduces dental plaque, treats canker sores, reduces constipation, can improve skin health, prevents wrinkles, and lowers blood sugar levels. That is why it is important to know how to grow aloe vera. After all, it is one of the cheapest all around products you can use for skin health, hair health, and overall body health. Taking care of an aloe vera plant in your home is easy, and we are here to help you grow it. 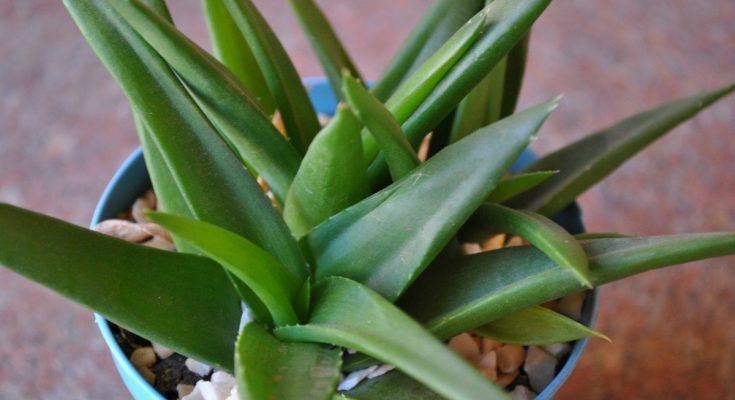 The first step in growing aloe vera plant is to realize this plant is a succulent. Well, succulent plants have some parts that are more than normally thickened and fleshy, as a way to retain water in arid climates or soil conditions. Cactus plants are the most famous succulents. Like cactus, aloe vera plants work best in dry conditions. Put them in a cactus potting soil mix or a regular potting soil that has been amended with additional building sand. Make sure that your pot has plenty of drainage holes. Aloe vera does not tolerate standing water. Important: put aloe vera in a place where they have proper light. The plant needs bright light, so the best area is south or west facing windows. You can use aloe vera plant to decorate a kitchen shelf or any other area of your home. Aloe vera doubles as a self-regenerating first-aid kit, and a decorative plant. With that in mind, how to grow aloe vera? We take you through the planting, growing, and harvesting aloe vera gel. How to plant aloe vera? Before you start with planting your aloe vera plant, there are a few things you need to consider. Now that we know what you need for planting an aloe vera, let’s go step by step through the planting process. Planting an aloe vera plant is the easy part. The challenging aspect is taking care of your aloe vera so it can grow large. Here are some pointers on how to allow your aloe vera to grow. How to replant aloe vera offsets? When your aloe vera is mature, it will produce offsets, which are commonly known as pups or plantlets. You can remove them and produce an entirely new plant in a separate pot. Here is how to do. How to harvest aloe vera gel for health benefits? The main reason you want to learn how to grow aloe vera is for the gel. Aloe vera gel has many health benefits, and you can harvest it at your own home. Remove a mature leaf from the plant, and cut it lengthwise. Squeeze the gel out, and then use it. You can apply the gel to a burn for relief. You can also lay the opened leaf gel-side-down on top of the affected skin area. If you need to use the gel for any other recipe for health benefits, just squeeze it.